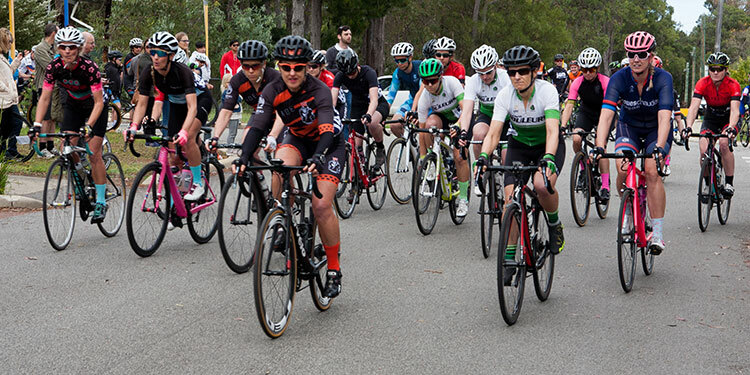 Last Sunday saw the running of the biggest race on the Peel Districts Cycling Club’s calendar, the Peel Classic Which saw riders race from Dwellingup towards Boddington, or in the case of men’s A grade beyond, before turning around and racing back to Dwellingup. The race is a tough undulating course, with a valley just outside Dwellingup providing the springboard for attacks in both directions even for the under 13s. Men’s A grade saw a breakaway form on that first climb out of Dwellingup and lasted through the turn at the South West Highway and most the way back. Just before the final climb the breakaway was caught and Tim Harvey who later stated in the post race interview “I am not a sprinter” attack, Harvey maintained his advantage up the climb and into Dwellingup to claim the win. Stephen Hall fresh from triumphs in the USA, sprinted away from the bunch up a difficult finishing straight to claim second, with evergreen Matt Upton third. Women’s A grade saw three members of the Dome Cycling used team tactics against Australian national mountain bike team member Sarah Tucknott. Dome’s Amanda Nabi reached Boddington first with her team mate Corrie Fillmore, Tucknott was two minutes in arrears and the rest of A grade well behind. On the return to Dwellingup, Tucknott closed the gap, but not enough. Nabi took the win, with Fillmore second and Tucknott third. Men’s B grade saw a breakaway of three formed on the first big climb out of Dwellingup. They were caught on the final climb on the return. With the remains of the bunch contesting the uphill sprint to the line which was won by Rapheal Amouroux whose celebrations caught the attention of the race referees. Theo Code was second with Scott Taylor third. Women’s B grade, was the biggest women’s field of the day and a fast race. The bunch was intact but strung out as they turned into the finishing straight. Teneal Attard took the win, ahead of Jo Boulton with Liz Burrows who was top three in A grade last summer third. Men’s C grade was another fast race, Dwellingup local Callum Hunter turned the final corner in the lead, but was caught in sight of the line by Michael Morris, .Hunter finished second and Blaise Paris third. Women’s C was a strung out on the run to the line which saw Gloria Stewart take the win, clear of Rebecca Lewis, wit Zoe Stolton third. Men’s D saw the bunch split on the final climb, with the run to the line Abraham Karyadi taking the win, with Thomas Wheeler second and Jason Kilgour third. 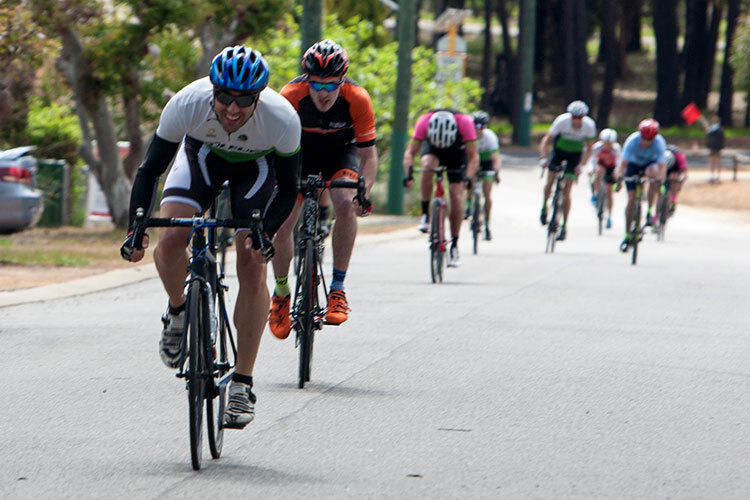 The two riders in Men’s E, decided that the 20 kilometres race distance was not long enough and raced with D grade for their full 40 kilometres, with Vern Merchant the first E grader home, mid pack in D grade and Tom Power second, not far behind. Luba Kovalenko the sole rider in Women’s D faced a different challenge, to race with the best under 13 riders in the state. Kovalenko stayed with the leaders, until that final climb out of the valley which saw Sam Washington ride away and take the win in under 13 men. Kovalenko chased Washington all the way to the line. Lachlan O’Brien outsprinted Guy Pertwee for second in the under 13 men, with Fay Wiggins taking the honours in the under 13 women, with Vanessa Baker third. The under 15s race saw Ben Pepper win the sprint to the line to take out the junior men’s honours with Michael Baker second and Daniel Morris third. Emily Wiggins finished with the trio to take the women’s honours, while Isabella Commons was not far behind second. The under 17s race saw the men spread around the course, with Courtland Wood taking the solo victory, ahead of Matt Connan second and Josh Commons third. The under 17 women was a different race with Danica Wiggins and Jasmyn Quick staying together until the sprint. Danica won the sprint, completing the clean sweep of the junior women races by the Wiggin’s family.